It so happens that my memory escapes me more often nowadays. It's called old age. Now I can't remember where I shot this but I know it is in Rome. I think it could have been part of the interior inside the Sistine Chapel. I do remember having a nice dinner inside the Vatican. Yes, we were privileged to dine privately inside what people would call the most holy place in the world. Not sure how our Tour Director pulled it off. The best part of the dinner was the wine and roasted pig, which is one of the things they make you eat to test if you are not a Jew or Muslim. Not an issue for me - they can throw in shellfish and all creeping things prohibited in the Old Testament, I'll eat them. I usually don't take photos of interiors as the lighting is usually bad. In this case, it was different. With the help of technology, I managed to get some nice bokeh and blurs to enhance the shot. Shot with the iPhone 7 plus. I dig its camera. Addendum: Rose reminded me that this was the modern double helix staircase designed by Giuseppe Momo in 1932, and was inspired by the original Bramante Staircase. 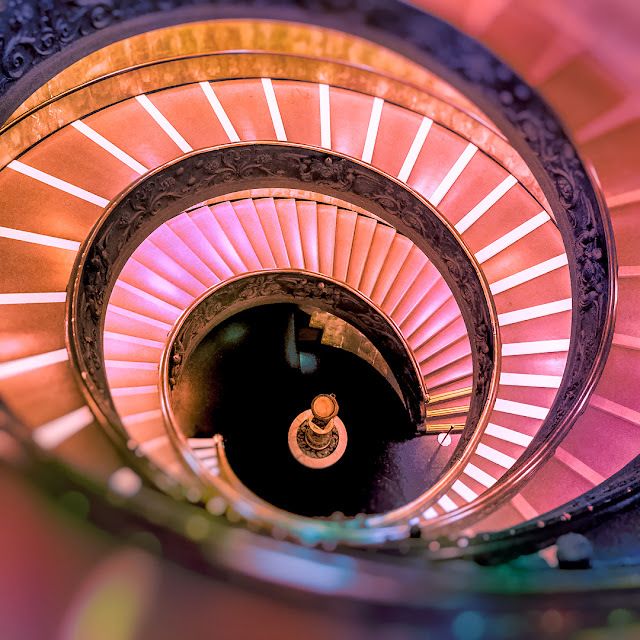 This staircase, like the original, is a double helix, having two staircases allowing people to ascend without meeting people descending; as with the original the main purpose being to allow uninterrupted traffic in each direction. Kind of like driving in the Los Angeles Freeway.